Let's say this upfront: this may not be the sort of Stealth review you're expecting. Prior to the Stealth I had little experience on any kind of skateboard, much less an electric one, so I won't spend much time comparing with earlier Boosted boards, nor will you hear about me bombing down a hill or weaving through rush hour traffic. 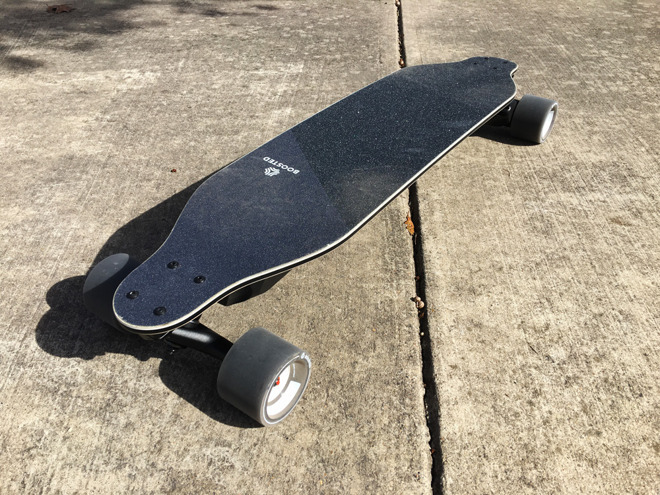 My goal with this review is to look at the board from different angles, instead: overall quality, how it works as a piece of Apple-connected tech, and of course whether or not you can have fun with it and maybe use it for commuting. Let's begin with the basics. The Stealth is a longboard like most previous Boosted boards, but no longer uses a bamboo deck, instead turning to a custom composite design combining poplar, fiberglass, and foam. The company has reinforced the edges to reduce wear, and done away with a mid-section taper. Other upgrades include metal pulleys and wider, Boosted-made 85-millimeter wheels. Aesthetically the board is pretty stunning, at least if you're into its monochrome scheme. Be warned that carrying and storing the Stealth is a small ordeal. It's 38 inches long, which consumes a lot of space in an office, bus, or closet. If you carry it by the trucks you probably can't let your arm hang straight down. It also weighs 17 pounds, so it's not ideal for carrying long distances, and don't expect to pull off tricks like ollies or kickturns. The payoff though comes in the form of performance and durability. 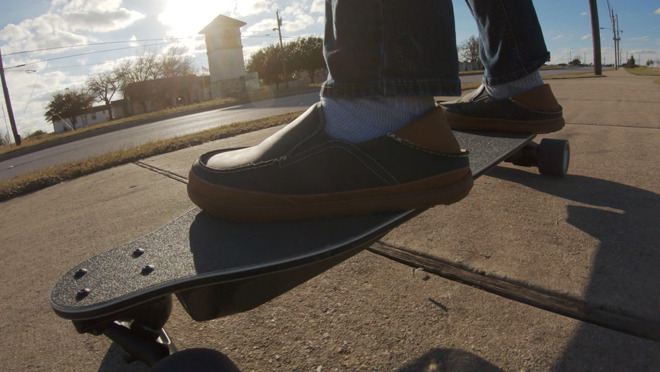 The Stealth is tough -- months of testing showed minimal wear despite dirt, stones, cracked and bumpy sidewalks, and repeatedly dropping the board to the ground. Riders of older Boosted boards have often noticed worse during the same timeframe. I'm told that the Stealth's ride is a little stiffer than some of its siblings and rivals, and in my experience you'll certainly feel most of the bumps on the street. The board is flexible enough that it absorbs some impact, and you can bounce up and down with ease. The key selling point of the Stealth is speed. If you select the board's fifth ride mode, Hyper, you can hit 24 miles per hour -- blisteringly fast when you realize the only things keeping you from eating asphalt are grip tape and balance. Boosted even scales up the responsiveness of the board's remote, so newcomers should avoid this mode until boarding is second nature. Naturally I started with the Beginner mode, which reduces acceleration and caps top speed at 11 miles per hour. You can't climb anything but small gradients either, so it's best to progress to one of the higher modes as soon as possible. The sweet spot for daily use is probably Eco, which improves acceleration and allows "small" hill climbs. Top speed rises to 16 miles per hour, which may sound low but ends up being the most practical cruise rate, if not slightly faster. As its name suggests, Eco also offers the best range -- around 12-14 miles -- without the tight limits of Beginner. Actual range is dependent on a variety of factors, such as temperature, your weight, and other strains on the motor and battery. Accordingly the board's range shrinks as you progress through Expert, Pro, and Hyper, to the point that Hyper range shrinks to half that of Eco. You can switch modes as necessary using either the handheld remote or the Boosted iPhone app. We preferred the app, since while it probably shouldn't be used in motion, it does let you see the range estimates for each mode and jump straight to them without triple-tapping a remote button. Grasping the basics of the Stealth is relatively easy. With the help of official Boosted videos and tips from veteran riders, I graduated from Beginner mode in a few 20-40 minute sessions. The trickiest thing was learning to turn and trust that the board's grip tape would keep me planted. Make no mistake though, this is not a Segway or a Bird scooter. Riding it takes skill, and early on you'll find yourself regularly leaping off the board to avoid a crash or fall. A helmet is a must, and I'd recommend wearing wrist, knee, and elbow guards until you're confident. I kept wearing wrist guards whenever possible after reaching that point, since as a writer I can't afford to damage my hands. The longer I spent with the Stealth, the more I came to appreciate that owning one is a lifestyle. You have to be willing to accept certain drawbacks, such as the previously-mentioned ride comfort. Boosted has tried to address the issue, but there's no getting around the fact that with the board's default wheels, it can be rough on anything but perfectly smooth pavement. It may be worth investing in bigger and softer wheels. There's also maintenance involved, as with any vehicle. You need to buy grip cleaner, periodically inspect your board, adjust the trucks (a skate tool is included), and ultimately replace parts like wheels or belts. If you want to ride at night, you have to invest in lights and/or reflective gear. More than anything you have to commit to riding regularly and pushing your limits if you want to maximize the Stealth's potential. It's not just about balance, but muscle-building and endurance for control at speed. To get to Hyper I followed a gradual progression, getting comfortable enough with each ride mode until I felt I could take the next step. The hardest thing as it turns out was not so much speed as coping with leaps in acceleration and braking -- I once picked up a bloody elbow wound on Expert after accelerating too hard from a standstill. In many cases conditions placed a hard cap on speed anyway. I found that I couldn't safely go any higher than 18mph on local sidewalks, even on long straightaways with zero pedestrians. At those speeds even slight movements can have significant impact, so the bumpiness of a sidewalk forced me to ease off. There were similar issues with wind. Gusty days were no-gos for setting records as my body would turn into a sail, making it tricky to stay balanced at any speed. I managed to transition from Beginner to Hyper in a little over two months, which isn't bad for a novice, if I do say so myself. Hitting 24mph ultimately proved a bridge too far, whether on roads or sidewalks, though I did come to appreciate the acceleration and braking power Hyper provides -- it felt like there was no hill the Stealth couldn't conquer. Can you commute with it? The short answer: probably not. The long answer is maybe, under narrow circumstances. The main considerations are range, time, and the nature of your route. While 14 miles sounds like an ample distance, that's still relatively short by urban standards, and you'll need to charge the board midday unless your trip is half that distance or less. Count on packing the Stealth's bulky charging brick next to your MacBook. You may need to leave earlier to get to work too, as even the best riders with 7-mile commutes won't be riding at 24mph the entire way. 8-14mph is a more realistic average, with speeds dropping further to cope with traffic, pedestrians, and tight curves. Some routes are insurmountable for the Stealth. It can't traverse gravel or grass, and while minor road bumps and cracks are okay, a deep one can send you flying. That even happened to me while shooting video, resulting in a sprained wrist and some serious road rash. Then there's the danger of vehicle impacts, since you probably won't have access to bike and park paths on every trip. On YouTube you'll find video of people weaving through Chicago and New York City traffic, but that's insane for us mere mortals. 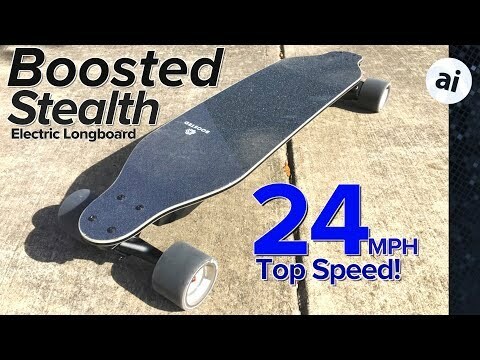 As a longboard the Stealth simply can't make sharp turns either. During my testing I sometimes found it faster to hop off the board, turn it, and hop back on. Weather-wise the board won't work on snow or ice, and you should avoid riding in the rain too because of traction and mud spray. Lastly, while Boosted's remote is ergonomic and intuitive, it leaves you with just one hand free to carry anything else. A backpack is a must for people carrying more than pocket contents. 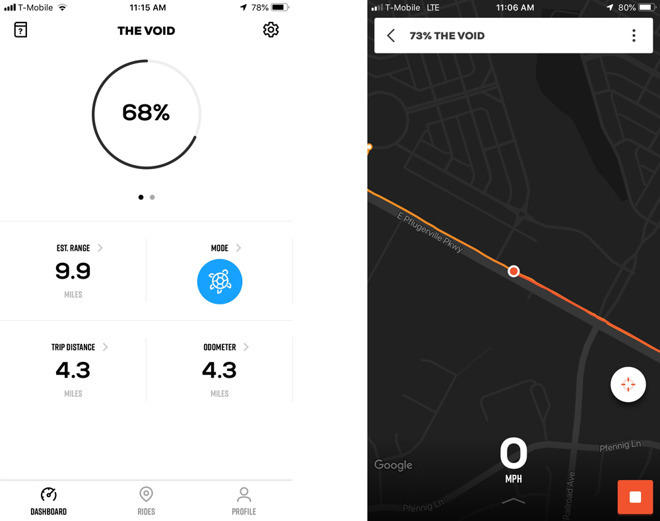 The Boosted iPhone app connects to the Stealth via Bluetooth. Apart from picking modes and estimating range, it lets you update firmware, check battery life, record rides, and share basic statistics with friends. None of this is necessary, given that the board and remote will work out of the box, and you can check battery status with button commands. Getting precise info was appreciated, mind, and recording rides gave a sense for how much progress I was making. As I continued to use the board, I could see my peak and average speeds rising. Boosted's iPhone integration is fine in this regard, yet the company could probably make better use of it. The app will notify you when the board is done charging for example, but there are no mid-trip "turn around" warnings when you have just enough battery to return, as with Onewheel products. For that matter, Onewheel owners with Gemini firmware can make infinite tweaks to board performance, whereas Boosted riders are limited to presets. Boosted additionally provides an Apple Watch app that displays current speed and battery life, but it's not as useful as you might think. You have to start the app before you ride, and raising your wrist to eye level at high speed is tricky business. Absolutely, once you get used to riding. The Stealth is best when you're free to go at your own pace, whether that's a relaxing 5mph or so fast that you need a motorcycle helmet. For all the risks and obstacles that I've listed so far, when everything clicks, there's nothing quite like it. There's a thrill and sense of freedom that's hard to match on other personal vehicles, even a motorcycle. And of course there's the reward of gradually mastering each mode and tackling new roads -- assuming you're prepared to go the distance. That's the catch of any Boosted board. If you check r/boostedboards on Reddit, you'll periodically catch people selling boards with less than 100 miles on them, sometimes less than 50. Many people assume they have the time and circumstances to making e-skating a hobby, only to find that their job, parenthood, or various distractions get in the way. To have a blast with the Stealth, you have to make room. As I said in my intro, the Stealth may actually be an ideal electric board for newcomers assuming they're in it for the long haul. It's friendly on Beginner mode and can take a beating, yet with a little maintenance it should still be relevant if you become the best longboarder in the city. You do pay for the privilege. The Stealth is $1,599, making it more expensive than any other Boosted board, and most other electric rideables for that matter. Most people will never need the raw power of Hyper mode -- in which case it's better to opt for a $1,399 Boosted Plus, from which Hyper is the only thing really missing, or even the $999 Mini X shortboard, which has the same range, sharper turning, and better portability at the expense of speed and shock absorption. For short or "last mile" commuting I would honestly go elsewhere unless you've got a very straightforward route. 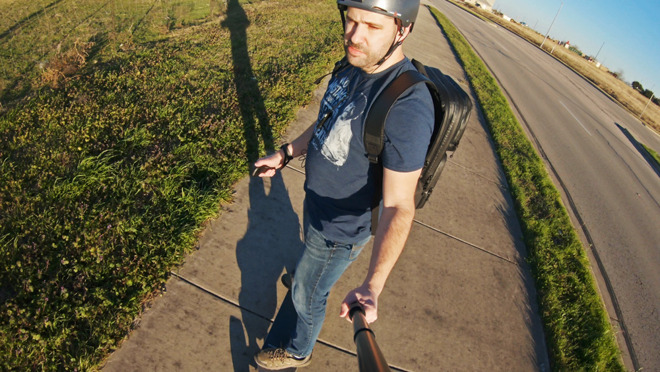 It'd be wiser to spend extra on a Lacroix or Onewheel+ XR -- which can cover rough terrain -- or buy something cheaper like a Segway miniPro, which may not be as fun but is certainly safer and more practical. Boosted recently revealed that it's working on products beyond skateboards. I'm genuinely interested to see where they go from here, especially if they follow through on promises of all-terrain rideables. If you want to give the Boosted Stealth a try, the electric skateboard is available at B&H Photo and Amazon for $1,599. B&H will not collect sales tax on orders shipped outside these states.